Home sales in Ox Bottom Manor had a break-out year in 2012, out-performing every recent year since 2005. The real estate graph at the right shows that distressed home sales are up, with thirty percent of all Ox Bottom Manor home sales being short sales, foreclosures, or bank owned homes. Nevertheless, the rise in home sales is good news for residents of Ox Bottom, as it has relieved some of the pent up supply that is accumulating. The number of Ox Bottom Manor home sales in 2012 could very well double the number sold in 2011. 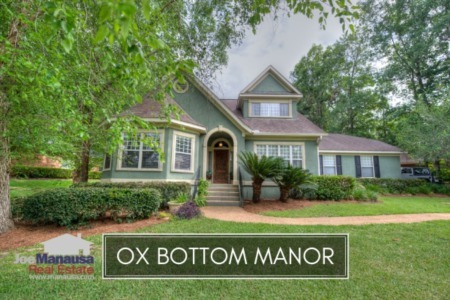 Currently, there are 55 homes for sale in Ox Bottom Manor in the Tallahassee MLS. 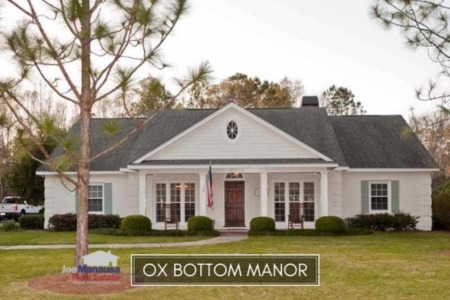 Ox Bottom Manor home values remained stable in 2012, which is doubly nice considering the increased rate of sales that occurred. 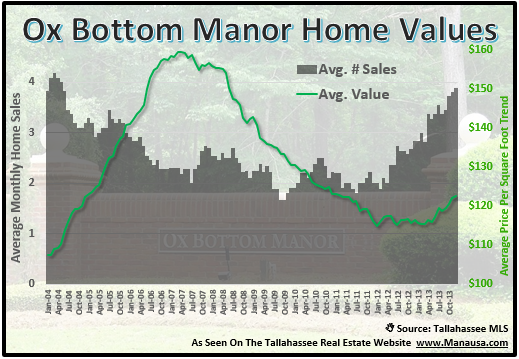 It is highly likely that we will see a renewal of Ox Bottom Manor home values decline in 2013, as distressed properties for sale will continue to create pricing pressure on all Tallahassee home sales. We know there are plenty more to clear from the shadow inventory, and only the pace at which they flow into the market will determine how fast the real estate recovery occurs. I hope you enjoyed our year end report on home sales in Ox Bottom Manor, please return again to find more Tallahassee neighborhood reports.